a nomad who spends part of each year on the road in a van with my collies. 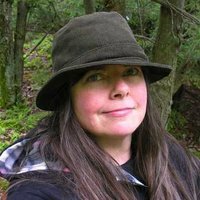 I'm a 50-something artist-writer-photographer who sold my farm and went on the road part-time after the death of my husband in 2008. I split my time between a home in Ottawa, a c.1860s Greek Revival house in Nova Scotia, and a house that I rent in Bisbee, Arizona. For the past 4 years, I have van-camping my way between my homes. I've traveled back and forth across Canada several times, but spent most of my time on the road in the western and southwestern states in autumn and winter. I'm also a member of couchsurfing.org and have occasionally hosted couchsurfers at my Nova Scotia place. Photography, website building, computers (Macintosh), some mechanical knowledge (I was an auto partsperson for many years). I've van-camped across most of Canada, mainly in campgrounds. However, once in the western and southwest states, I camp mainly on forest service or BLM lands - either small primitive campgrounds, or dispersed sites. 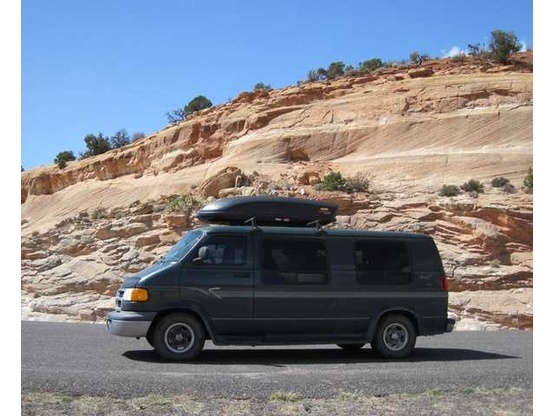 1999 Dodge Ram van - a basic conversion van with a large cargo box up top.